Obviously the media likes to cover political controversy, but Greg Sargent and others argue that the inflated media coverage of judicial rulings against the Affordable Care Act distorts the public’s view of the law. Of course, it’s possible it just seems like rulings against the ACA are getting more coverage. Steve Benen checked. 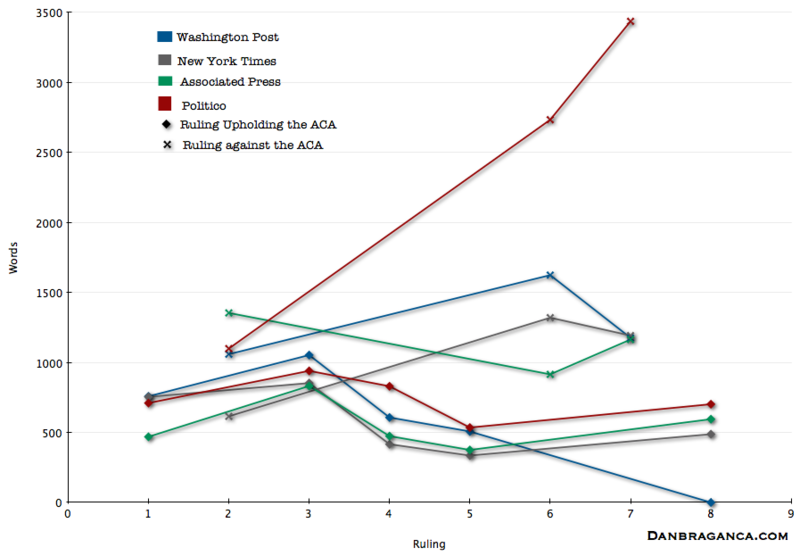 In every instance, conservative rulings received more coverage, longer articles, and better placement. I took the liberty of graphing Benen’s numbers. First by individual news source. Now, total coverage by ruling. Even though rulings uphold the ACA by 5 to 3, casual news consumers probably don’t have that impression. [update 14 November]: The Supreme Court will hear a challenge to the ACA. Looks as if you and Elizabeth Warren have something in common. Both are influencing the Occupy Movement. Keep up the nice work! Any plans on setting up a table in Boston? Looks like you meant to comment under this post. But, no plans. I’m content with any influence I can provide from my outpost here.